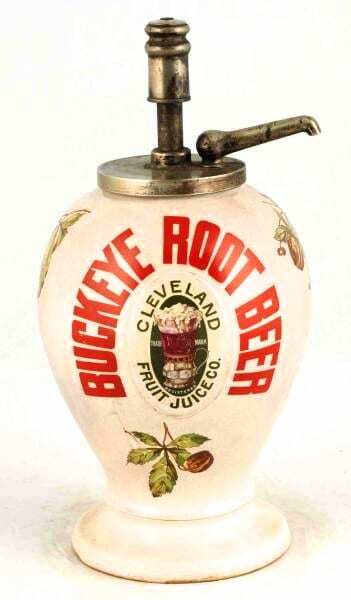 This is a Buckeye Root Beer syrup dispenser from the Cleveland, OH Fruit Juice Co, circa 1890-1915. 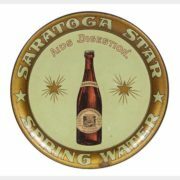 It is made of ironstone and features a decorative decal image of a frothy mug of root beer in the center. The name Buckeye Root Beer is over the mug and the manufacturer’s name Cleveland Fruit Juice Co. encircles the mug. An image of sprigs of Buckeye are featured at the bottom of the syrup dispenser. The dispenser is on the top of the pump with a glass shaped finial that includes the company’s name. It stand 16 inches tall with the pump. 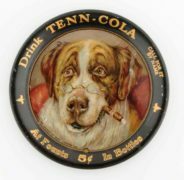 This is one of the earliest soda dispensers and is considered valuable. Syrup dispensers are one of the most coveted items in the soda collectible category. They were used in the old soda fountain shops and drug stores during the early 1900’s. These dispensers are highly sought after soda collectibles because they are hard to find. Since there are not that many styles, these dispensers typically bring more money than any other soda collectibles. 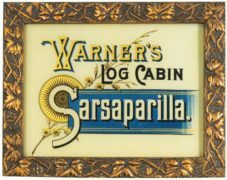 Syrup dispensers were made of stoneware crockery, ironstone, fine porcelain, frosted or painted glass, or metal, and advertised the brand on the side with the company logo or catchy slogan. 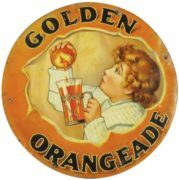 Soda fountain syrup manufactures would often give the soda syrup dispensers away free to neighborhood pharmacies as a way to advertise their brand as long as the drug stores bought enough of the soda syrup.